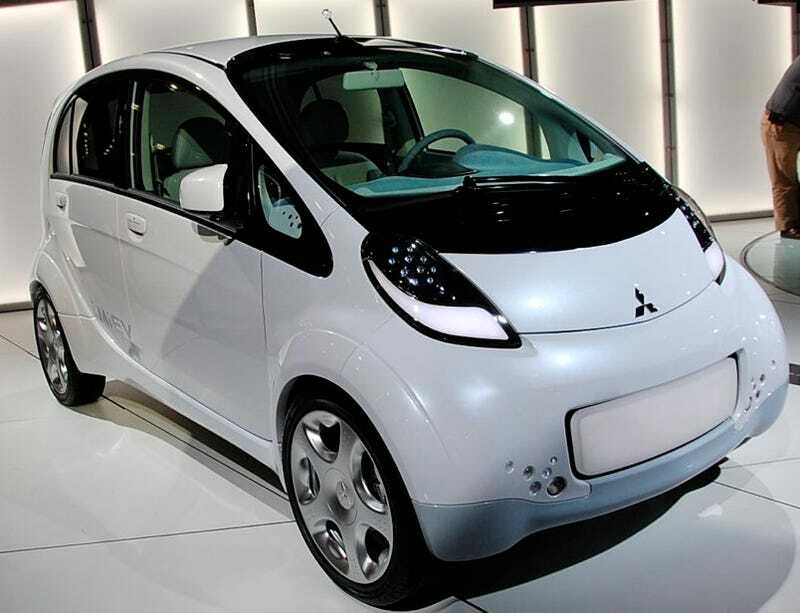 Mitsubishi has formally announced intent to sell it's all-electric Mitsubishi iMiev in the United States before 2012. Furthermore, they've announced a partnership with Portland General Electric to develop the infrastructure to support it. Mitsubishi officials here at the New York Auto Show brought with them an iMiev outfitted with left-hand-drive in order to announce they intend to deliver a version of the Mitsubishi iMiev for the US market sometime before 2012. It may not be called the iMiev, but it will be powered by the same lithium-ion battery in the current versions undergoing fleet testing. Those batteries will be the limiting factor to the total volume though, as the supply of lithium will dictate the volume of the battery packs. The additional announcement of a partnership with the State of Oregon and it's primary power supplier, Portland General Electric, to develop a ready infrastructure of charging stations to support electric cars. The greenie-greens in Oregon already purchase the most sustainable energy of any place in the nation, so the partnerships there make perfect sense. Mitsubishi Motors is accelerating its drive toward greater environmental responsibility and reinforcing its Drive@Earth global sustainability initiative by announcing today its commitment to develop the pure electric, four-passenger Mitsubishi i MiEV for global markets. Ending months of heightening speculation, Mitsubishi Motors North America President and CEO Shinichi Kurihara confirmed the i MiEV (Mitsubishi Innovative Electric Vehicle) is being developed for sale in world markets, including the United States. "Electric vehicles are one branch of the automotive landscape and we are dedicated to providing these technology-sourced solutions as an important path for the world's clean-air options," explained Kurihara, who stood alongside a Left Hand Drive i MiEV during his address to journalists at the New York International Auto Show. "We believe the i MiEV delivers on the promise of sustainability, suitable range, performance, and innovative packaging and styling." The award-winning Mitsubishi i MiEV is expected to be the world's first practical electric vehicle offered by a major automobile manufacturer when fleet sales begin this July in Japan. Kurihara was pleased to also announce that the State of Oregon and Portland General Electric (PGE) (NYSE:POR) are joining Mitsubishi in the i MiEV partnership program. "State of Oregon Governor Ted Kulongoski is a progressive thinker who is providing a roadmap of the future," commented Kurihara. "The State of Oregon and Portland General Electric will become valuable partners in helping validate the future of all electric vehicles." Details of the programs are being finalized, but the findings from these real-world, independent tests will play an important role in further advancing the car's development for the U.S. market. "Oregon welcomes the partnership with Mitsubishi as we transition to the next generation in vehicle technology. Together, we can build a consistent and reliable infrastructure so consumers can make the switch seamlessly to electric vehicles," Governor Kulongoski said. "The partnership shows that a state can create opportunity for its commitment to a greener future - wins for our economy and our environment." PGE is rolling out a network of charging stations across its service territory in Oregon and the addition of i MiEVs further facilitates its support of next-generation electric vehicles. PGE currently has more than a dozen charging stations up and running. "We are developing a model charging station infrastructure across our service territory to advance the electric vehicle market in Oregon for our customers," said Jim Piro, president and CEO, PGE. "Our customers are number one in the nation in purchasing renewable power so clearly they are committed to sustainability. We expect Oregon to be one of the top markets for next generation electric vehicles. We look forward to partnering with Mitsubish iand the state of Oregon on this important project." Based on the successful Japanese market "i" car, the electric version replaces the i's conventional gasoline engine, transmission and fuel tank with an advanced lithium-ion battery system, electric motor and onboard charging system. Unique rear mid-ship architecture allowed Mitsubishi Motors to seamlessly integrate the new components under the seats, luggage compartment and floor deck, meaning no compromise in interior cabin space. In fact, there are few visual sight cues that indicate the vast technological differences between the gasoline and electric models. With its high-torque electric motor and clever packaging, the i MiEV offers an intelligent combination of useful performance with small physical and carbon footprints, plus a roomy interior and a sensible range of approximately 80 miles from its advanced lithium-ion battery pack. The i MiEV's battery pack consists of 22 modules, each one consisting of four cells that can be installed in either a vertical or transverse position under the i MiEV's floor. The i MiEV's onboard charger automatically adapts between a standard 110 outlet - which takes 12-14 hours - or half that time on 220. There is also a fast charge connector that allows the battery to reach 80 percent of capacity in just 30 minutes. The proprietary lithium-ion batteries are purpose-built for automotive applications. It is produced by Lithium Energy Japan, a joint venture among GS Yuasa, Mitsubishi Corporation and Mitsubishi Motors.